Claire Max, professor of astronomy and astrophysics at UC Santa Cruz and director of UC Observatories, was awarded the American Astronomical Society's 2015 Joseph Weber Award for Astronomical Instrumentation at the AAS winter meeting in Seattle. Max is a pioneer in the field of adaptive optics, a technology that removes the blurring effects of turbulence in the Earth's atmosphere, allowing telescopes on the ground to see as clearly as if they were in space. 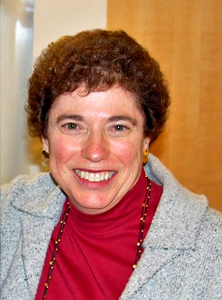 A co-inventor of the laser guide star technique for astronomical adaptive optics, she has helped revolutionize the capabilities of ground-based telescopes. Max has served as director of the Center for Adaptive Optics at UC Santa Cruz, and in June 2014 she was appointed director of UC Observatories on an interim basis. "Claire Max has continually pushed the technological envelope, which has enabled ground-based telescopes to have the crystal clear vision that would otherwise be available only in outer space. Her work has touched not just astronomy, but has also had important consequences for improved imaging of objects ranging from satellites to the inside of the human eye," said Greg Laughlin, professor and chair of astronomy and astrophysics at UC Santa Cruz. In a citation accompanying the Joseph Weber Award, the AAS recognized Max "for co-inventing sodium laser guide star adaptive optics and for shepherding adaptive optics from its roots in classified space surveillance to its prominence today as an essential technology on large telescopes. Her leadership has truly advanced the field of adaptive optics and transformed how we observe by making near diffraction-limited imaging possible on large telescopes, thus opening new fields of discovery including resolving stars and gas near supermassive black holes and studying extrasolar planets." Max has received many awards and honors for her accomplishments in astronomy and physics. She is a member of the National Academy of Sciences and a fellow of the American Academy of Arts and Sciences, the American Physical Society, and the American Association for the Advancement of Science. She received the U.S. Department of Energy's E. O. Lawrence Award in Physics in 2004. Max joined the UC Santa Cruz faculty in 1999.